I ended up with over 35 new (or new-to-me) polishes this month, the above photo is missing a few because they are either on loan or scattered through my house. January was a good month for polish because all my end-of-the-year sale purchases arrived along with a few sakes that took place right at the beginning of January. 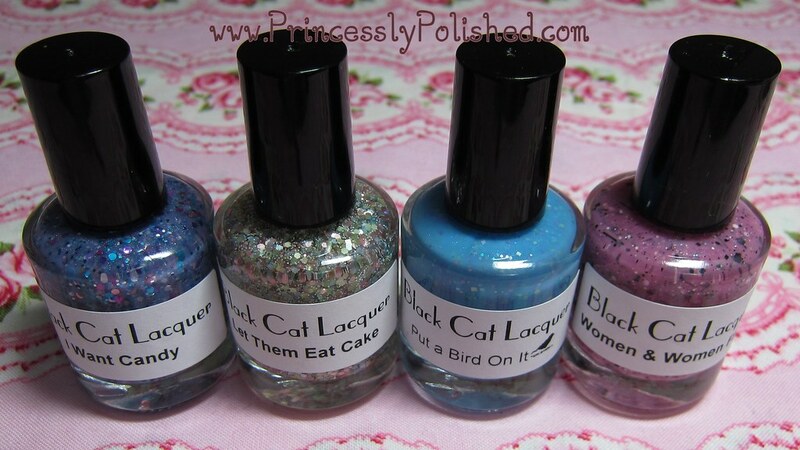 I snagged some Black Cat Lacquer polishes from my wishlist, they are: I Want Candy, Let Them Eat Cake, Put a Bird On It, and Women & Women First. These came from etsy. These are all so, so pretty! 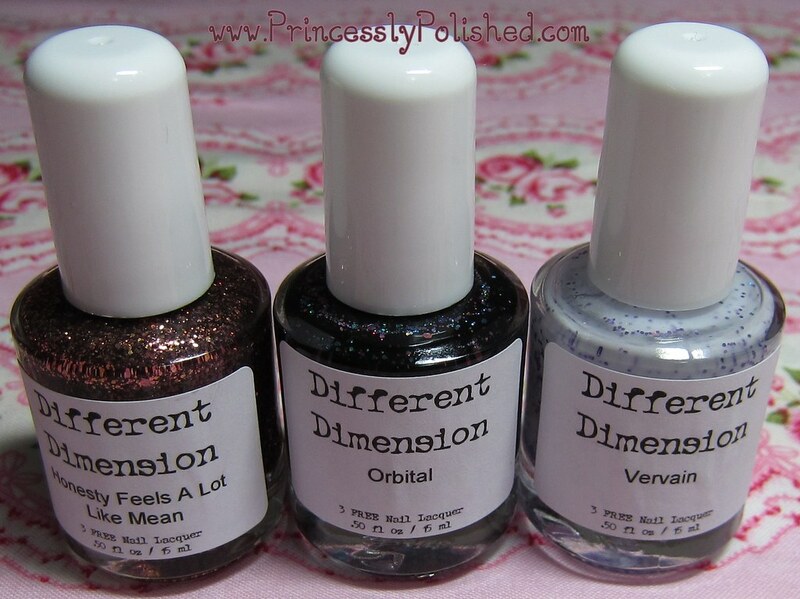 I had a most wonderful package of Different Dimension nail polish arrive. Mostly colors that I've helped name, but a few other pretties to swatch and review, too! I've gotten to try most of these already, and their posts are up on the blog. The polishes shown above are: Honesty Feels A Lot Like Mean, Orbital, Vervain, Aorta Miss You But I Don't, All Red-y In Love, A Love Hue, and Love Her? I Don't Even Lacquer! Not pictured because it is on loan to my Mom: Yours, Mine, and Flowers. You can find these polishes on etsy. I picked up a couple discontinued polishes from Laquerlicious, Invitation Only and Mint N Chip Frappe. Along with those I was sent three minis to review, Melted Ice Cream, Rainbow Sugar, and Tart Taffy. Go check out those swatches! These also came from etsy! Lush Lacquer had a sale, so I picked up my first polishes from them. The colors I picked are Glitter Girls, Mr. Bubble, Oopsie Daisy, Pebbles, Pink Panther and Slumber Party. These are all so cute! Visit the Lush Lacquer shop on etsy. 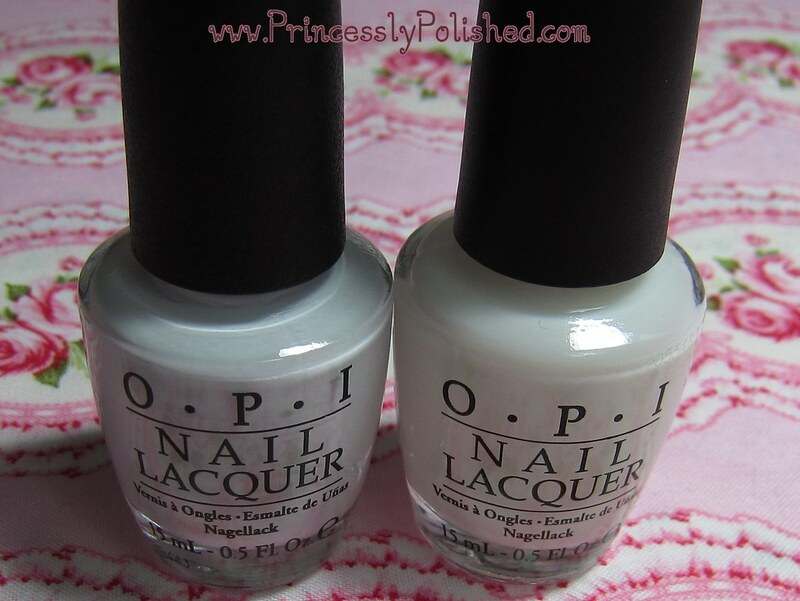 I snagged a couple OPI polishes from my wishlist, My Boyfriend Scales Walls and Don't Touch My Tutu! When Zoya had their promo for three polishes my husband got me a few cremes from my wishlist: Breezi, Jolene and Wednesday. These polishes were partly from a trade and given to me. 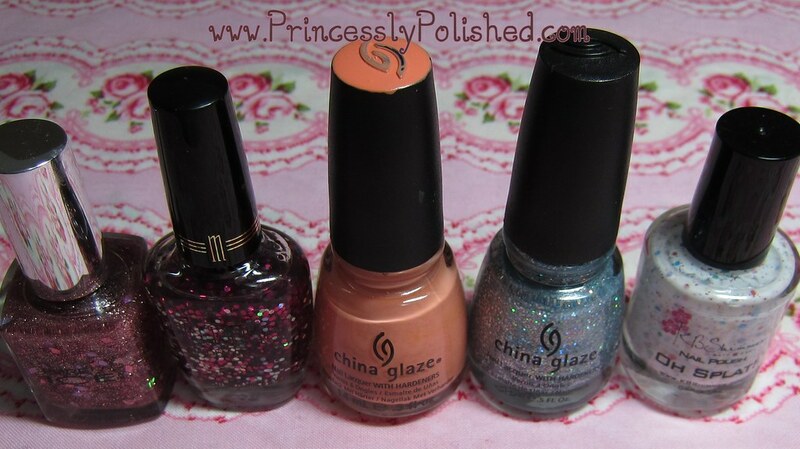 Pure Ice Material Girl, Milani Hot Pink, China Glaze Peachy Keen and Luna, KBShimmer Oh Splat! 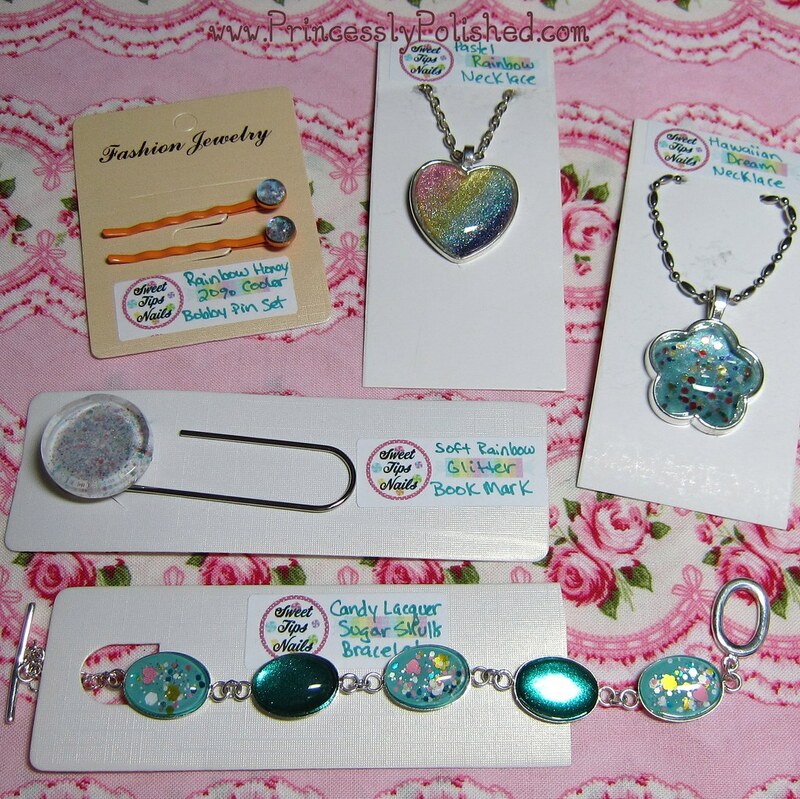 And nail polish in another form - jewelry! Sweet Tips Nails had an amazing sale, so I picked up some necklaces and other accessories. These are really cute! The shipping prices are really good, too. And yes, these came from etsy, too! Thank you so much for featuring my jewelry in your post! I hope you enjoy it! Haha! Thanks for the warning, I guess? 2/22 is almost the end of the month; February is short. So it won't be too bad! You're welcome! Thanks for the great sale and checking out my blog! have the cash from the same period of time. this too Ppir.At anger over christine lagarde's tax-free salary - it was called her "let them eat cake" moment. So Much For Blogging This Month!